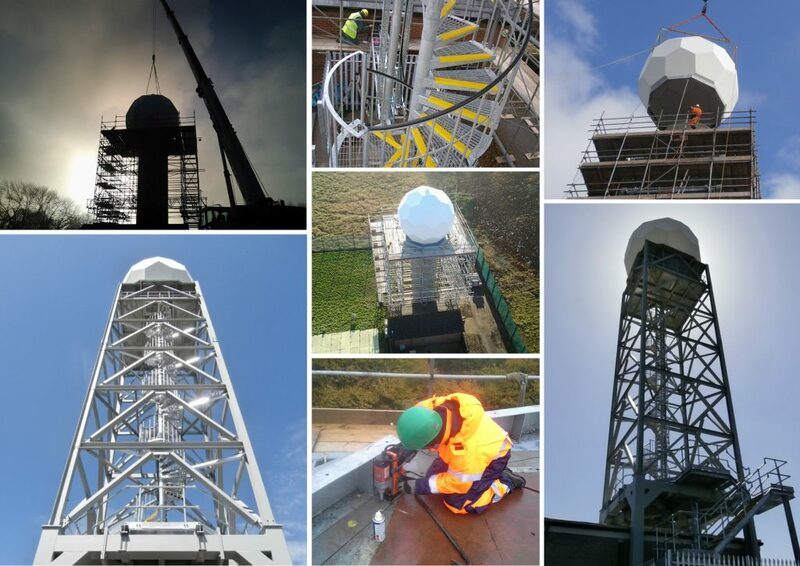 For Lancashire firm, LARS Communications, the outlook is bright, thanks in part to a number of contract awards from the Met Office to carry out improvements to its radar infrastructure. LARS Communications is an industry leader in radio site build and antenna system installation and commissioning. Included among the core services LARS offers are tower strengthening and structural upgrades, services which are essential to the Met Office as it tackles a programme of improvements to its radar infrastructure, in order to increase its radar capability. The latest tender to be awarded to LARS Communications by the Met Office is for the radar site upgrade at Dean Hill, in Wiltshire. The 22.5m tower will require a number of structural upgrades, including a spiral staircase, to ensure that it meets all health and safety standards. The improvements to Dean Hill fall under the ‘Weather Radar Network Renewal Project’, which is jointly funded by the Met Office and the Environment Agency. This is a programme of investment in, and improvements to, the fifteen operational weather radars across the UK. These provide real time information to help monitor and forecast heavy rainfall. The programme will see the use of the latest technology to meet radar capability. This will help to address current network challenges and provide a radar service which has the ability to meet future requirements such as hydrometeor classification, as well as extending the life of the network by fifteen to twenty years. The rollout has been split into four phases. Phase 1 was the initial software installation which was undertaken during Winter 2010/11. Phase 2, which took place between December 2011 and December 2012, saw the full network being upgraded with the installation of new transmitters with Doppler capacity. Phases 3 and 4 are ongoing and address the infrastructure upgrade and resilience upgrade respectively. Before Phase 4 can be commenced (the installation of a new dual channel receiver, dual polarization antennae and a high specification radome), Phase 3 has to be completed. This phase addresses the Health and Safety requirement to fit steel staircases from ground level to the top of the tower at each site, as well as carry out structural repairs where needed. LARS has recently completed structural upgrades at a number of sites, including Clee Hill in Shropshire, Castor Bay in Northern Ireland and Cobbacombe in Devon. The usual requirements on each site include overseeing the removal of the existing radome and radar system; the removal of existing ladders, platforms and hand-railing; the installation of new platforms on the structure; the installation of companionway ladders; and the installation of new spiral or straight staircases to the top platform all before the new radome and radar system is installed. All sites are then thoroughly inspected and given safe to climb certification. The majority of steelwork fabrication is carried out in LARS’ fully equipped in-house fabrication workshop and is all CE Marking accredited.